GRANGEFIELD OLD Boys march on after putting pressure on current leaders Farsley Celtic with a convincing 4-1 home win over fellow title hopefuls, Drighlington. From the kick off the early warning signs were there for Drig, as Grangefield pressed Drighlington high up the pitch. However, an error by Matty Benson meant he headed into his own net and the visitors took the lead, albeit against the run of play. Grangefield were unfazed by this setback and continued to keep the pressure on Drighlington. Chris Barr and Andy Kenyon were the heroes for title-chasing Grangefield as they both notched two goals. This victory is a vital one for Grangefield as they continue their attempt to climb the mountain towards the Premier Division title. Alwoodley came from 3-0 down to shatter Stanningley hearts. Three goals up without reply after 25 mins, and Stanningley were cruising with Tom Stewart, Jamie McGeorge and Josh Townsend all bagging one each. Alwoodley woke up after the third goal and sprang into action. A Dino Mulavdic penalty kick-started an Istanbul-type comeback as they reduced the score to 3-1. Just before the break an own goal reduced the deficit to one goal. The first two goals in the second half were trademarks for the returning Callum Armstrong and put Alwoodley 4-3 ahead. James Turner put Alwoodley 5-3 ahead after a deflection in the Stanningley penalty box. Leeds Medics & Dentists continued their magnificent nine-game winning streak as they beat Athletico 3-1 away from home. Medics took the lead after 30 minutes through Jean Mark Ekegue but were soon pegged back by Mohammed Qasim as he equalised. Goals in the 65th and 88th minutes from Ekegue clinched his hat-trick, the 3-1 victory and all three points for the Medics. Calverley edged a seven-goal encounter with Ealandians. An own goal put Ealandians behind early on before Wayne Crossley scored two fine goals to give Calverley the lead. Jack Mills drilled home from 25 yards to level matters. With Calverley in the ascendancy Ealandians regained the lead thanks to Dave Kerr. Matty Wilson made it 3-3 in the 90th minute and looked to have rescued a point, but there was time for Dale Spink to net the winner from five yards as the Owls stole all three points. 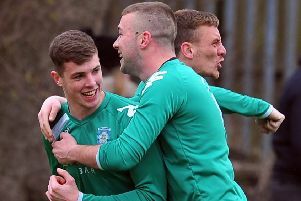 In the Championship, Mount St Mary’s took the lead early on against league leaders Gildersome Old Boys thanks to Connor Parsons but Matty Jackson restored parity by the break. Tenth-placed St Mary’s worked hard but a second goal for Matty Jackson and one for Jamie Lloyd confirmed that Spurs remain top of the Championship after their 12 games. Garforth Crusaders dismantled Leeds Medics Reserves 5-0 as they moved away from the dreaded relegation zone. Among the scorers for Crusaders were Thomas Helliwell, Jamie Taylor, with two, and Damon Barrow, with one. Second-bottom Leeds Independent drew 1-1 with Ealandians Reserves. It was Daniel Leahy who notched the first-half goal as Ealandians dominated proceedings. Mark Beattie was on hand to secure a point for the strugglers and the game ended 1-1. Beeston St Anthony’s remain bottom, losing 7-5 as they hosted Morley Town AFC. The first half was action packed and it was 3-3 at half-time. Morley’s goals were scored by Lamin Bah, Phil Davis, two for Robert Gumbley and a hat-trick for Ryan Hartley to complete a perfect day. This week’s result of the day came in Division Three as New Middleton kept their 100 per cent record going as they put eight past Leeds Modernians as it finished 8-1 to the visitors. Jamie Davies is now up to 33 goals for the season.